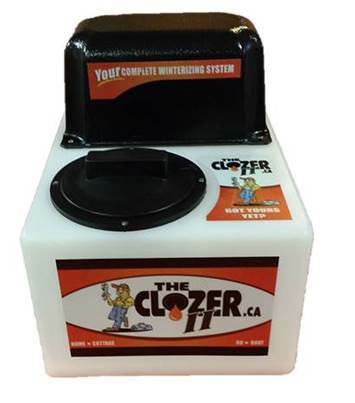 New to The Clozer line up – THE CLOZER II, a more economical way to ensure that your plumbing system is protected during the winter months. Same 100% Peace of mind, same savings to be had as with The Clozer Original, but at a lower cost…. It’s a win/win. FILL IT UP HOOK IT UP PLUG IT IN and you’re ready to winterize your indoor hot/cold waterlines, drains and water related appliances. No pre-draining or blowing out the waterlines, no crawling under the cottage or taking apart valves, or appliances, and wondering if you got all the water out. With the addition of our TC-3 valve you can easily winterize your main water supply line to the lake or well, by hooking up THE CLOZER II to TC-3 and filling that line completely with plumbing antifreeze while pushing all the water out – all at one time.